This post is all about wedding reception lighting! Unless you’re having an outdoor daytime celebration, wedding reception lighting isn’t something you should push to the bottom of your to-do list. When executed properly, it can actually be a tasteful, trendy and totally flattering addition to your wedding reception! So while custom printed napkins are nice and all — invest in fun and festive lighting choices that are bound to transform your venue and leave a lasting impression on your guests. Here are a few of our favorite creative lighting ideas that will help bring your reception to life in a way that really shows off your personality — and adds a dramatic flair to your special day! Have a monogram designed with either the first letter of your first names or the first letter of your new last name together. Whether you ask someone to design it or do it yourself, you can use this to adorn your wedding reception! Have it projected on the dance floor or the wall for everyone to see. This amazing effect will then transfer over to your images when your personal monogram shows up in the background of all of your wedding photos! You can even have a cake topper made of your monogram, have it printed on the table numbers, or if you want to get fancy, ask your florist to create one with flowers. This is an easy way to not only set the overall mood of your wedding reception and match your theme. Think about your color scheme and what hues would complement them. If you’re having a tented celebration, perhaps a warm amber, soft pink or white lighting will help to light up the area whilst creating a romantic glow to your special day. You may, however, want to create a club or lounge vibe for your reception and with the newest uplights available makes this is easy to achieve. Talk with us to decide what color would work best and how to use it to add a hint of romanticism and fun. 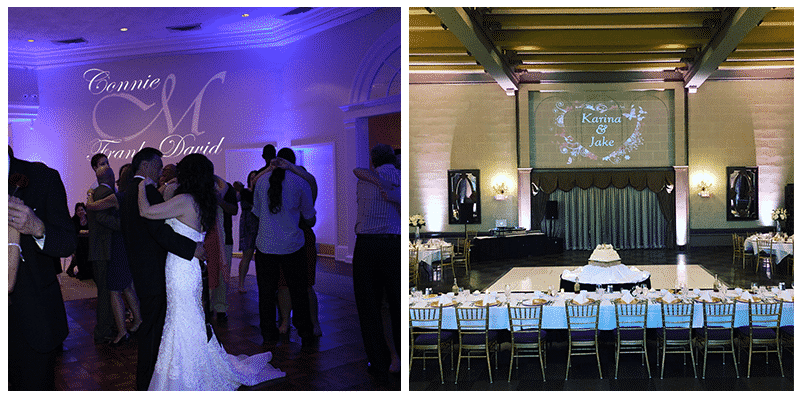 Take your wedding theme to the next level with a video wall to reinforce it! This luxurious addition is perfect for couples planning a wedding where the theme plays heavily to the seasons. Planning a fall wedding? Project falling autumn leaves. Want a winter wedding? Include snowfall and other nifty wintery effects. It’s a convenient way to really tie in the theme of your special day without enduring (and subjecting your guests) to the harsh outdoor conditions. Having a backlight set up toward the back of the reception space is yet another great element to add to enhance the overall quality of your wedding photos. There’s another bonus for backlighting becuase it will make you and your new spouse look even better on the dance floor, and it will help direct the guests’ eyes toward you, the newlyweds! 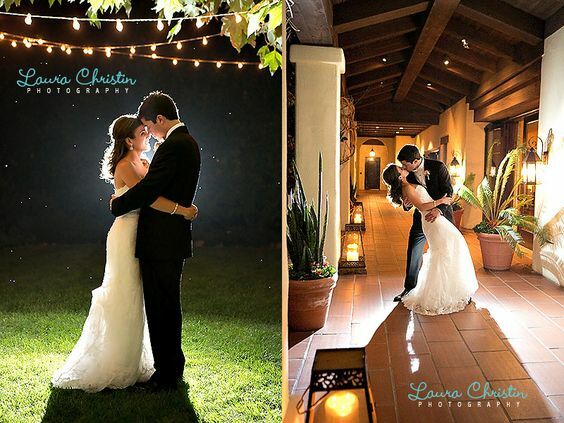 The effect will add a romantic glow to the guests who cross the lit path and will make for awesome photos. 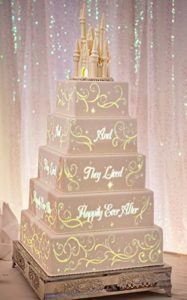 Let’s be honest, the wedding cake is one of the most important reception display items. Why keep the wedding reception lighting ideas limited to the walls? 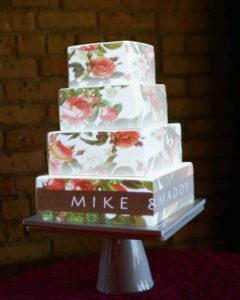 You can project video or pictures directly onto the cake and really bring it to life. Think of it as animation for your cake — fireworks, a slideshow of the two of you, a scene from your favorite movie. The sky’s the limit! If you want everyone at your reception to have a great view of the sugary baked good before they devour it, don’t pass up the opportunity to give the cake its time to shine. There are many types of wedding reception lighting. What’s your favorite? Request a quote from SoundWave for premium wedding lighting.